Culture is our Business and Social Media is the Method of Communicating It. It’s been a while since my last blog post. Let’s just call is year end and holidays shall we? I must admit I have also been busy observing the effect of social media on Canadian Culture through the lens of #idlenomore. As a social media specialist I would have to be living under a rock not to see the hash tag trending many times over the last 42 days, and yet, oddly enough, I see very few of my “fellow” social media” peers in Calgary, Vancouver or Toronto mentioning it at all in any way, shape or form. I find it a bit odd but then again I often wonder what they think it is to be engaged in social media communications as an “expert” for businesses. For now, I have to assume that like the status quo of Canada, they choose to ignore Idle No More, thinking that it will soon go away. For now, anyhow, it’s just business as usual. Which makes me laugh as that idea of Business as Usual has already been shattered by Brian Solis in his book “NO MORE BUSINESS AS USUAL”. 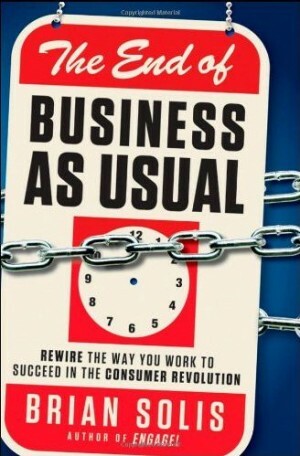 This title makes clear the effect of Social Media on the culture of Business. I was educated in Canada’s finest Art Colleges and then did what I consider to be my Masters of Business Imagination by hanging out at the McLuhan Centre for CULTURE and Technology at the University of Toronto for several years in 1993-94 while working at the Art College as a Corporate Fundraiser, as part of team that raised one million dollars, to create the First New Media Lab at OCA — so I am attuned to not only Canadian Social media and business but Canadian Art and Culture. As McLuhan said “Culture is Our Business”. For all those so called social media specialists in Alberta, Toronto and Vancouver who have not mentioned or weighed in on this movement, which is now a part of Canadian “pop” culture – here is some advice —go back to school and study McLuahn, his Laws of Media along with studies in art and culture. These provide a foundation for critical thinking. For those who think that culture is not our Business and who instead think that the business of the white European Settler, of our grandparents, including my family who settled in PEI from Scotland four generations, that is over 100 years ago along with the fathers of confederation and who signed those treaties with the First Nations of Canada. Those fathers included men from the British Crown, the Scots and the Irish. If you think for one minute that they were not focused on their own self interest in the form of European philosophy and culture over that of the diametrically opposed collective culture of First NATIONS — please do me a favor and update your consciousness as soon as possible. 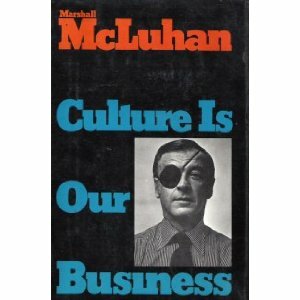 There is a reason that McLuhan chose the pirate eye patch to be worn by the white business man on the cover of his book Culture is our Business. While the effect of Idle No More has yet to be felt in the Canadian business community per say —it’s effect on Canadian Culture will be with us for decades to come. As First Nations move steadfastly towards updating Canadian Culture on the importance of their inherent treaty and collective rights —- business, aka the corporate body—- in Canada remains, at present, cool, calculating and unchanged. Ironically it is social media that has now imposed the elephant that will dominate the board rooms for decades to come. Lucky me I happen to work through this new communications channel and have my ear to the ground, it affords me to remain informed on the new and the NOW. One day, many moons from now, I look forward to an open conversation with my peers on this matter, until then I will keep my left eye and ear open to the winds of change and try not to get blown away down here in Lethbridge, Alberta by the total lack of media & cultural literacy that has faced me every day since my return home to Alberta from the “big smoke” of Toronto over one year ago. Even though I was born and raised in Alberta the only word that comes to mind with respect to this attitude is one I learnt in art school. The word is “provincial“. A dangerous place to be for more reasons than one.